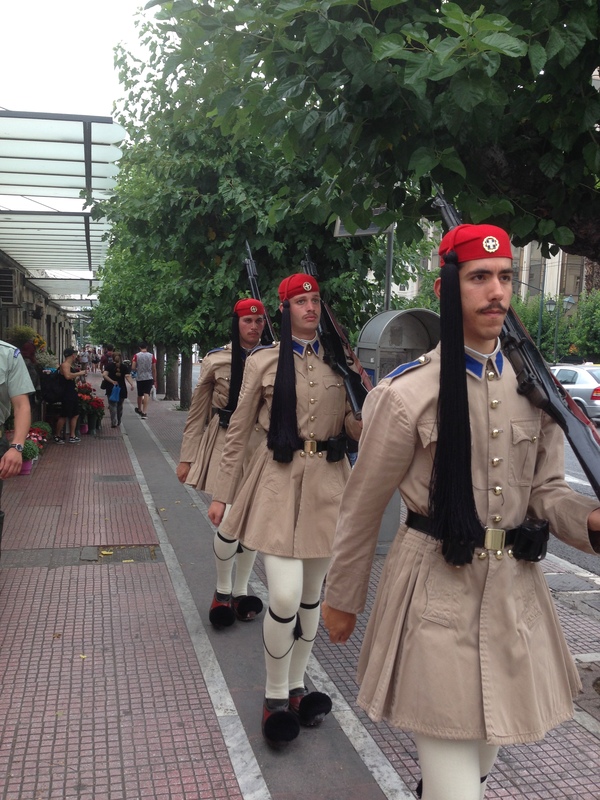 Cruising the Aegean – Day 10: Athens | Now, I'm Just Amused. 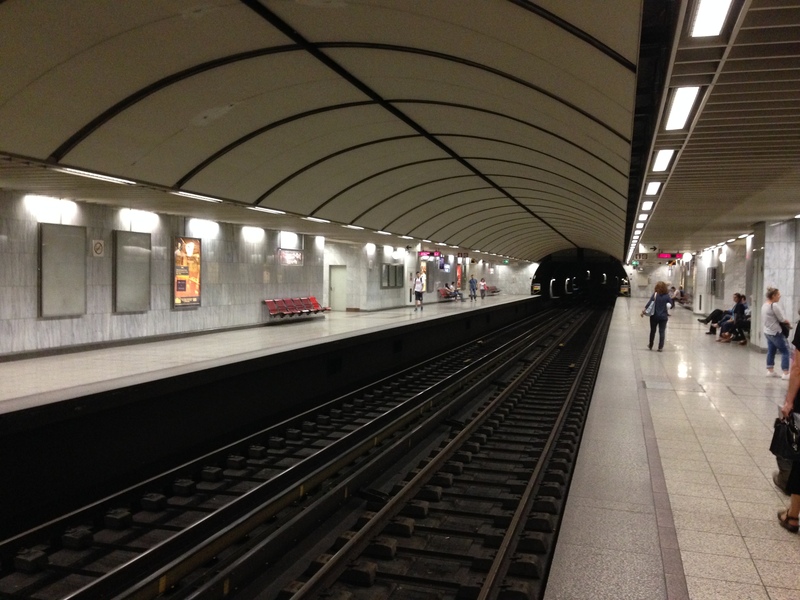 We arose early Monday, had a great breakfast at the hotel, and headed for the subway. 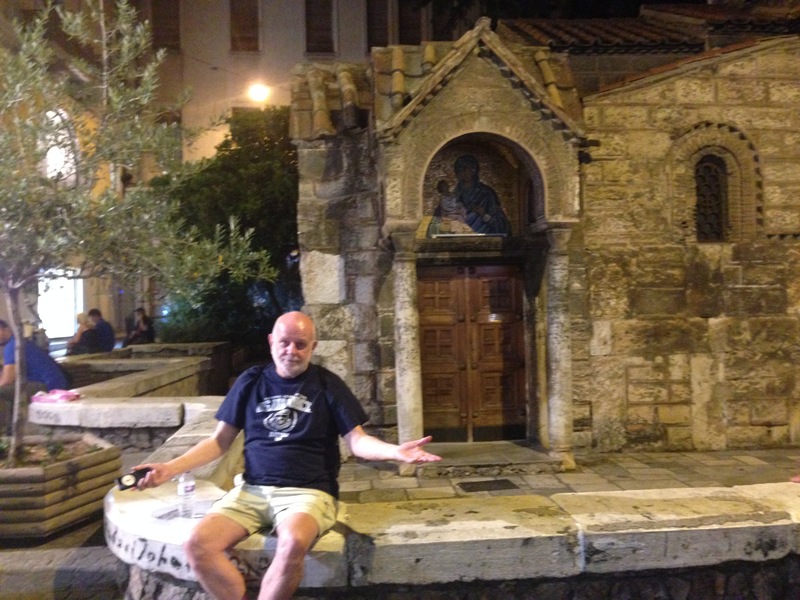 I have to note how surprisingly clean Athens was. For a city in hard economic times, I was expecting more trash at the curbs and more grime generally. But it was much cleaner than NYC or even Boston. 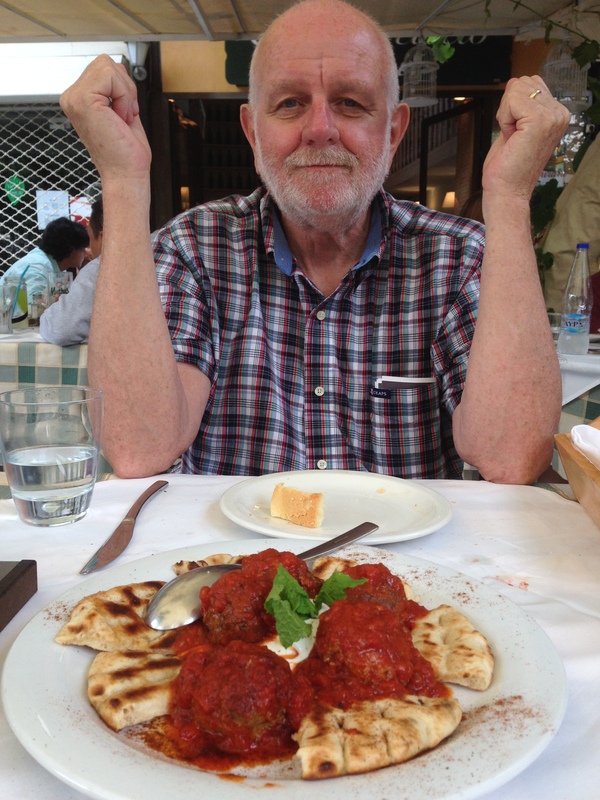 Istanbul was also a surprise in this way. 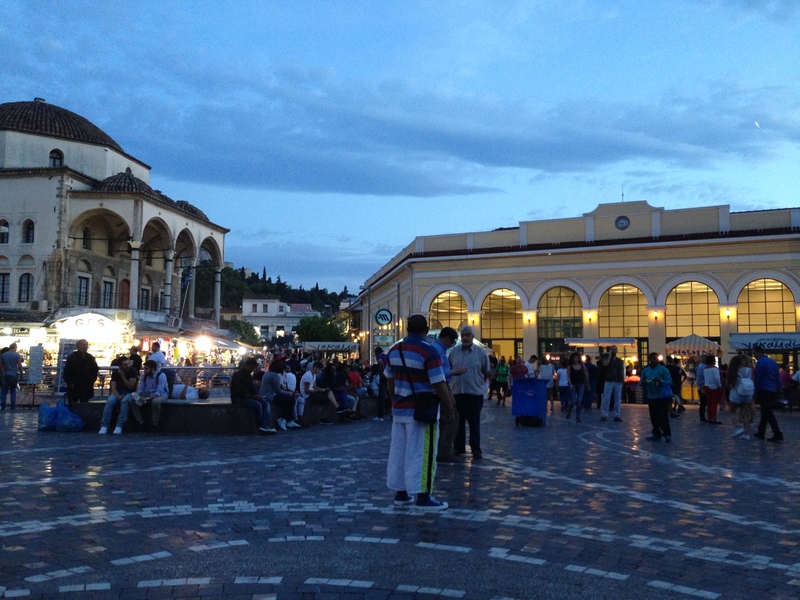 Naples, unfortunately, was filthy. 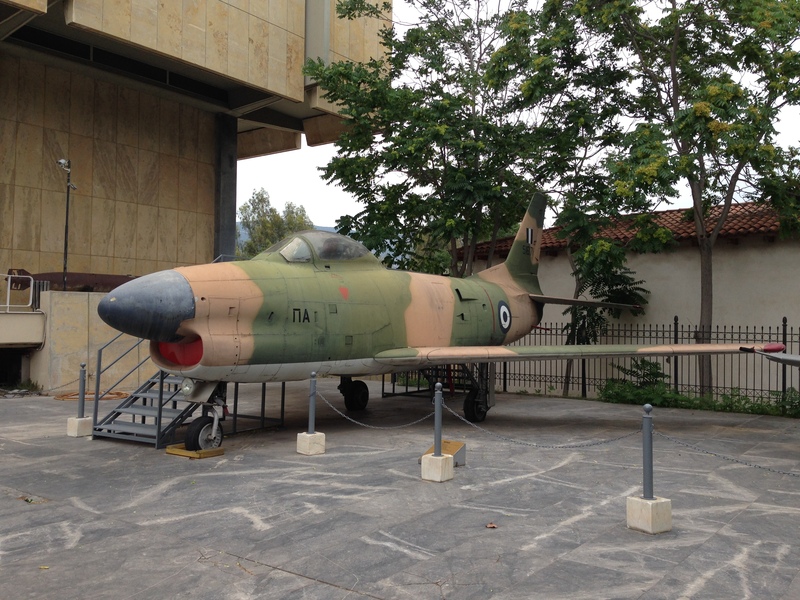 While riding around on the tour, I noticed there was a War Museum almost next to the Parliament House. A must see. 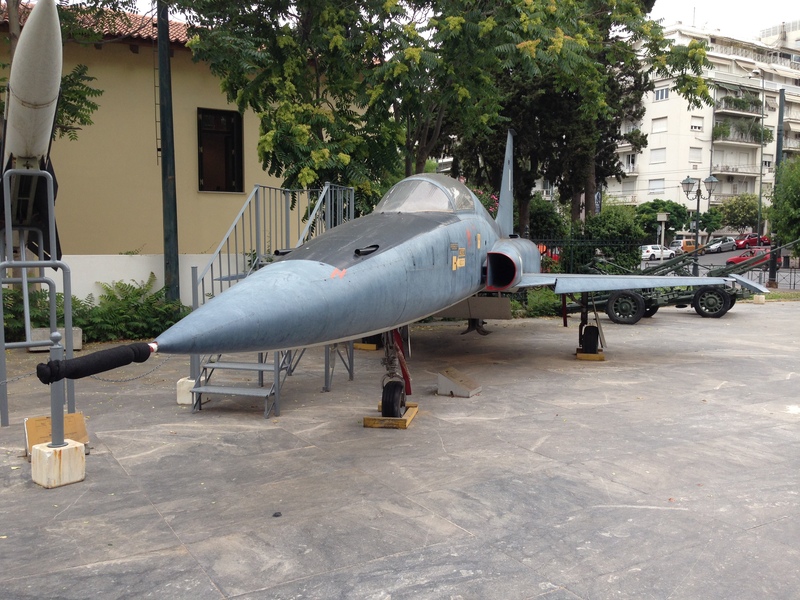 The exhibits inside highlight the many wars Greece has participated in, right up to the present time, with lots of guns and maps and stuff. Mostly in Greek, though. 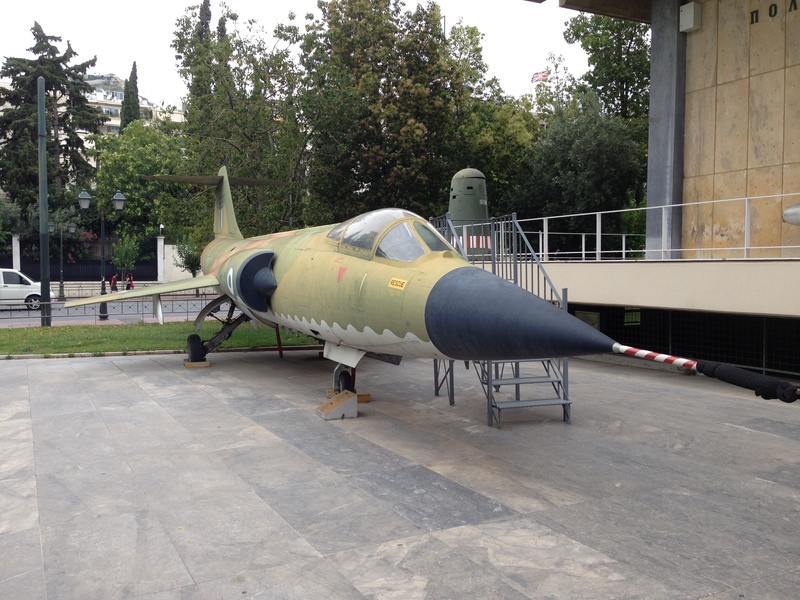 An F-104. 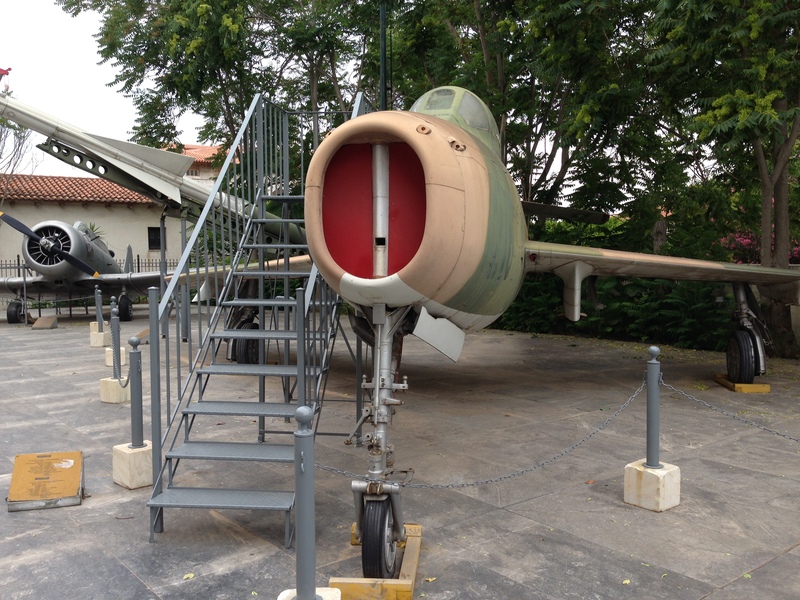 The official name was “Starfighter” but the pilots who flew in these bullets had their own pet name: “Widowmaker”. It was pretty unforgiving to fly, I guess. As we were leaving the museum, we heard the tramp of boots coming from the direction of the Parliament. We walked out to the sidewalk in time to see this. Don’t let the pom-pom shoes and silly hats mislead you. Mussolini and his Nazi pals found out these boys can fight like demons. We stopped for lunch at a well-recommended and interestingly named restaurant. Greek meatballs. They tasted even better than they look. 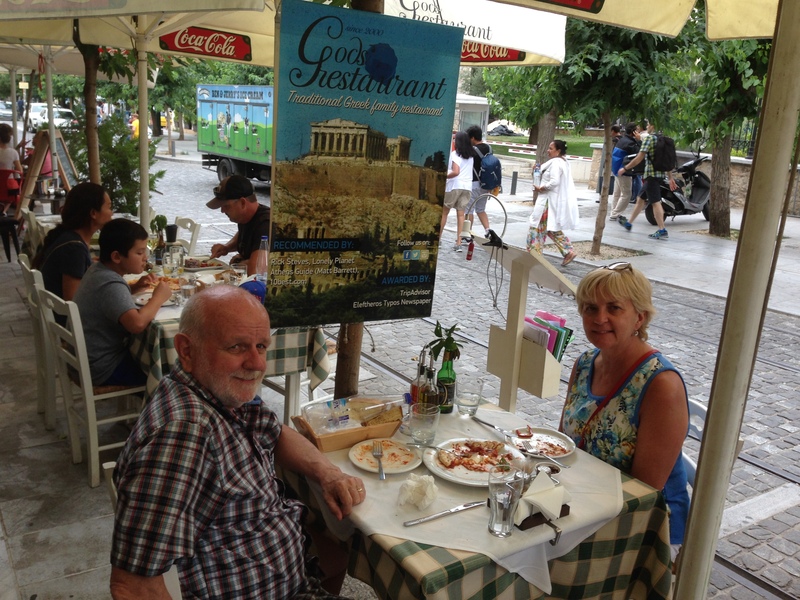 Of course, we started with a Greek salad for two. 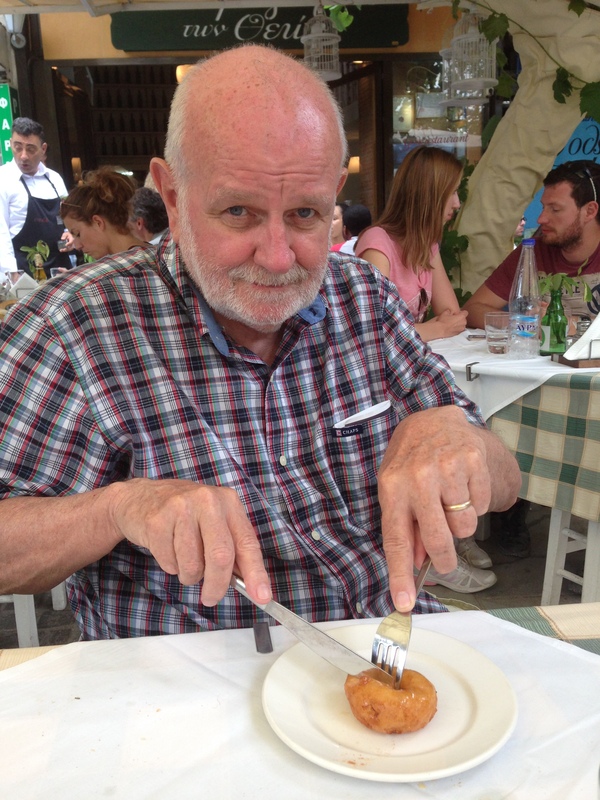 After the (delicious and inexpensive) meal, I got a complimentary Greek donut. It was also delicious. 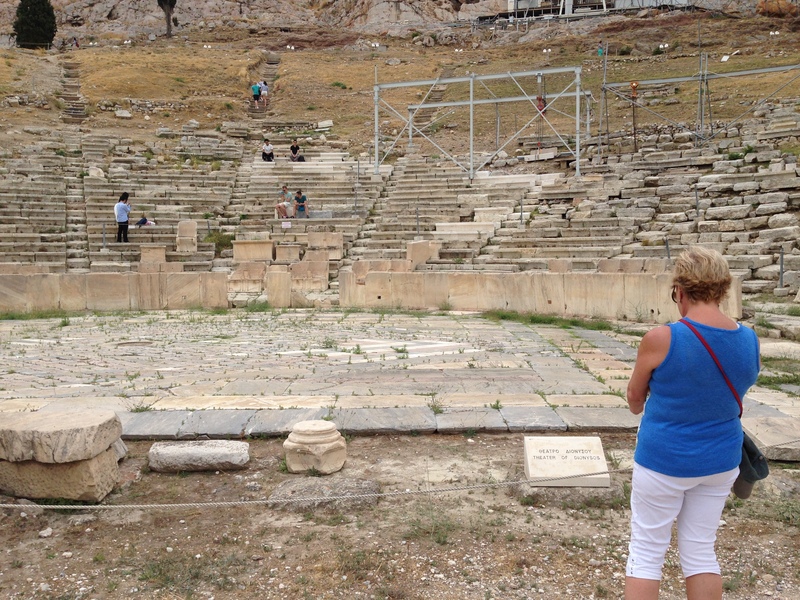 After lunch, we headed back to the Theater of Dionysus to continue our cultural enrichment. 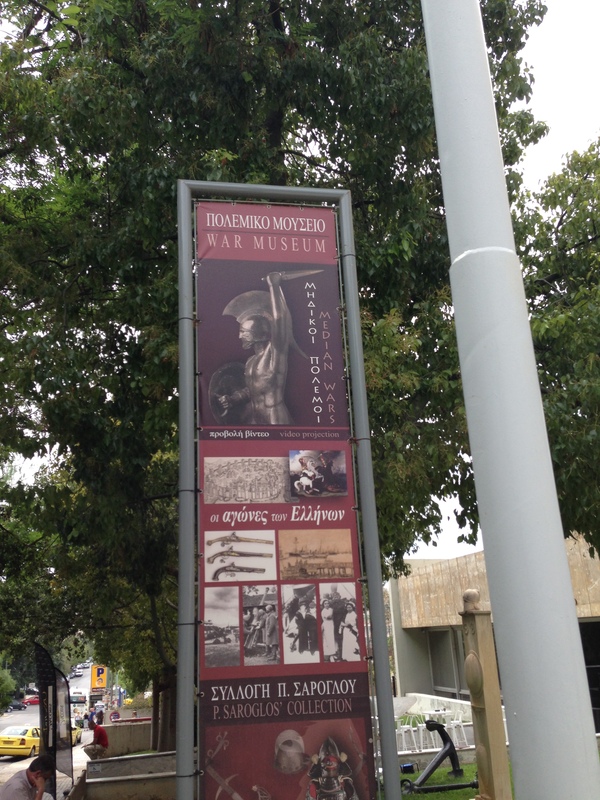 We were told by yesterday’s tour guide that the 20Euro ticket would still be honored today. Not true, said the woman collecting tickets. But Betty told her our story and how it was our last day and she relented. Nice lady. 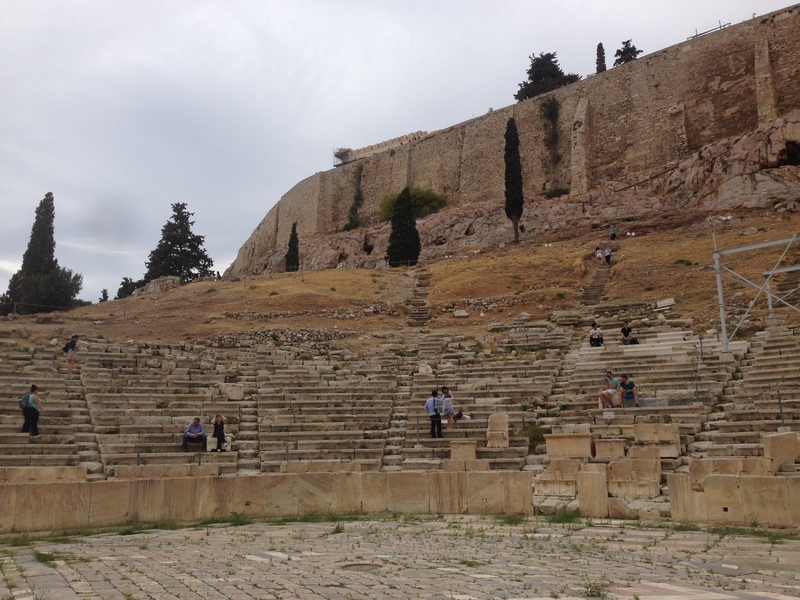 The Theater, under the walls of the Acropolis. 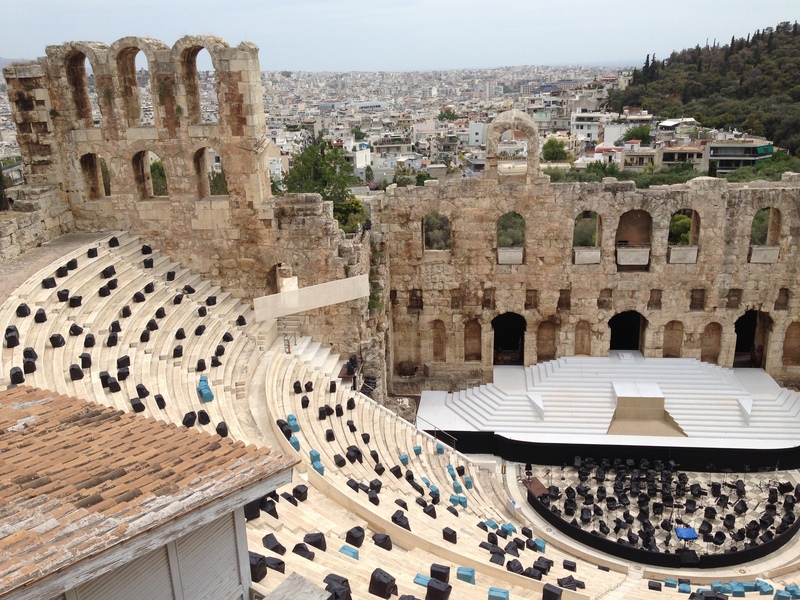 Wikipedia: The Theatre of Dionysus Eleuthereus is a major theatre in Athens, built at the foot of the Athenian Acropolis. 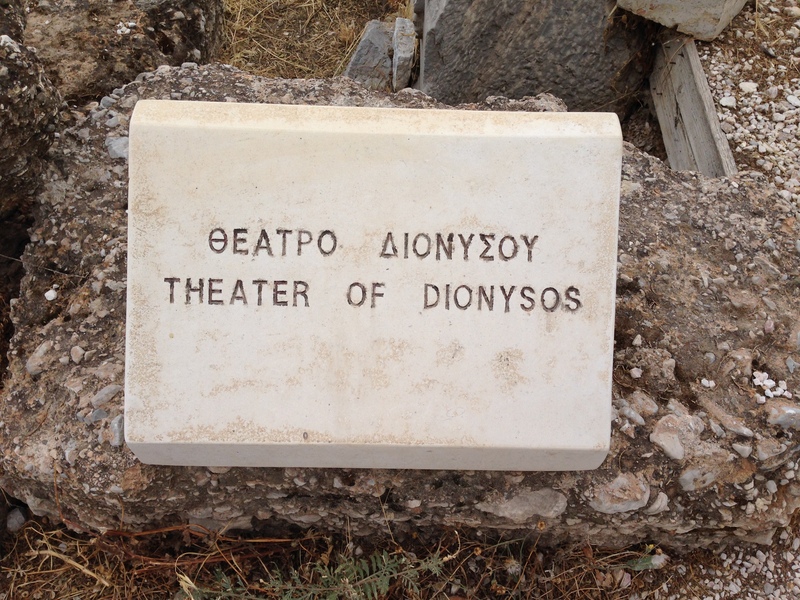 Dedicated to Dionysus, the god of plays and wine (among other things), the theatre could seat as many as 17,000 people with excellent acoustics, making it an ideal location for ancient Athens’ biggest theatrical celebration, the Dionysia. 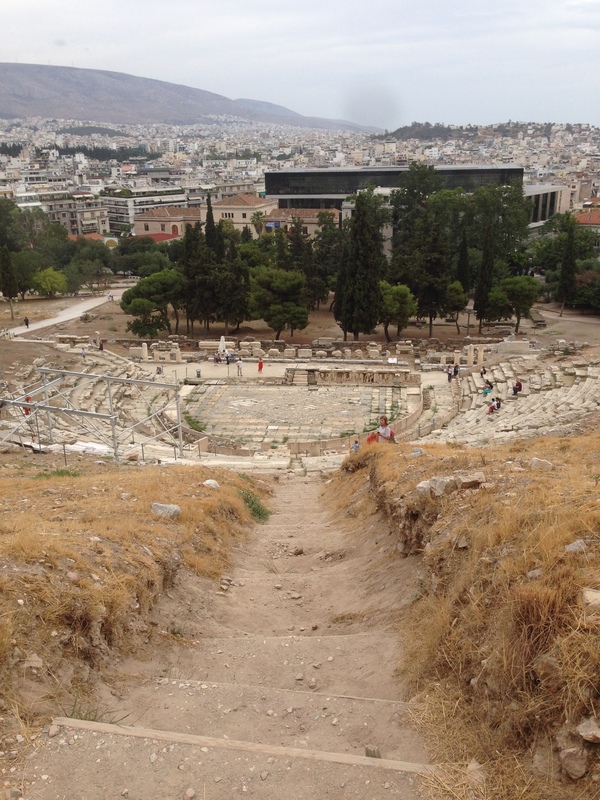 It was the first stone theatre ever built, cut into the southern cliff face of the Acropolis, and supposedly birthplace of Greek tragedy. 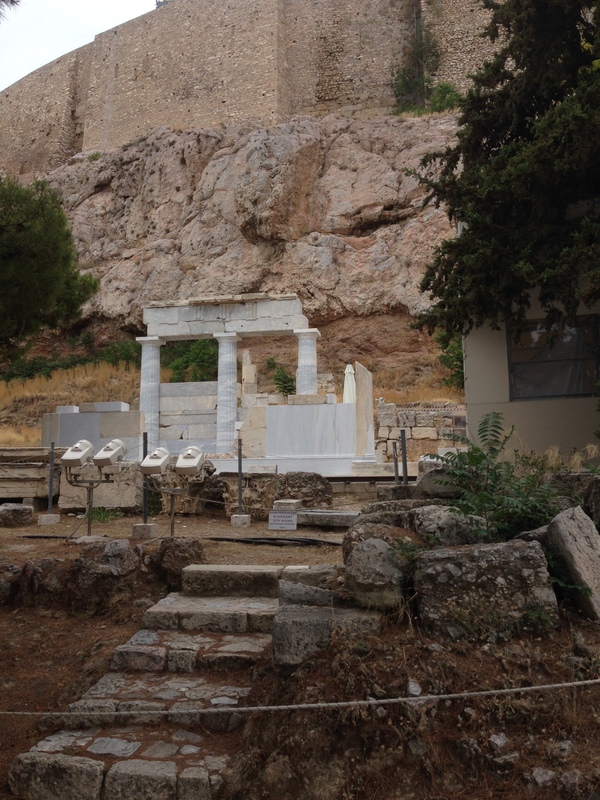 The remains of a restored and redesigned Roman version can still be seen at the site today. 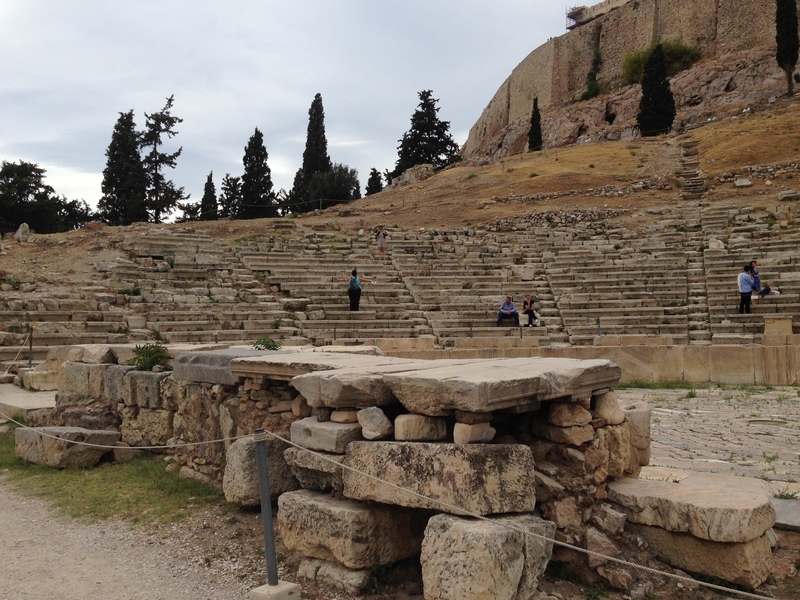 The site was used as a theatre since the sixth century BC. 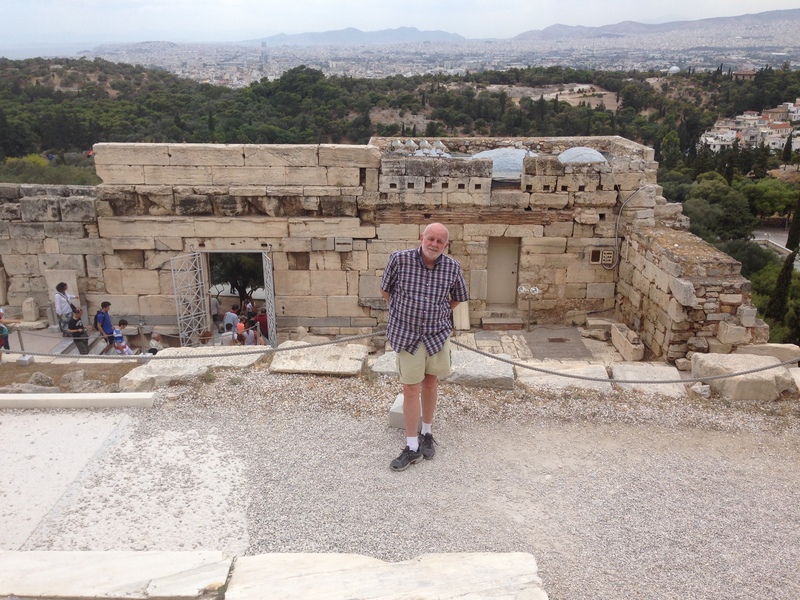 The existing structure dates back to the fourth century BC but had many other later remodelings. 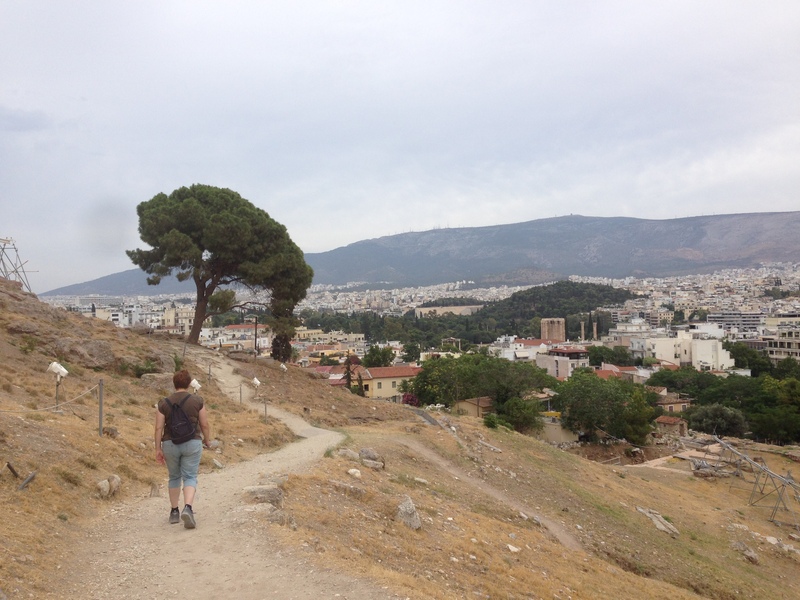 We were now back on the Acropolis grounds and the overcast day meant the sun was less harsh. 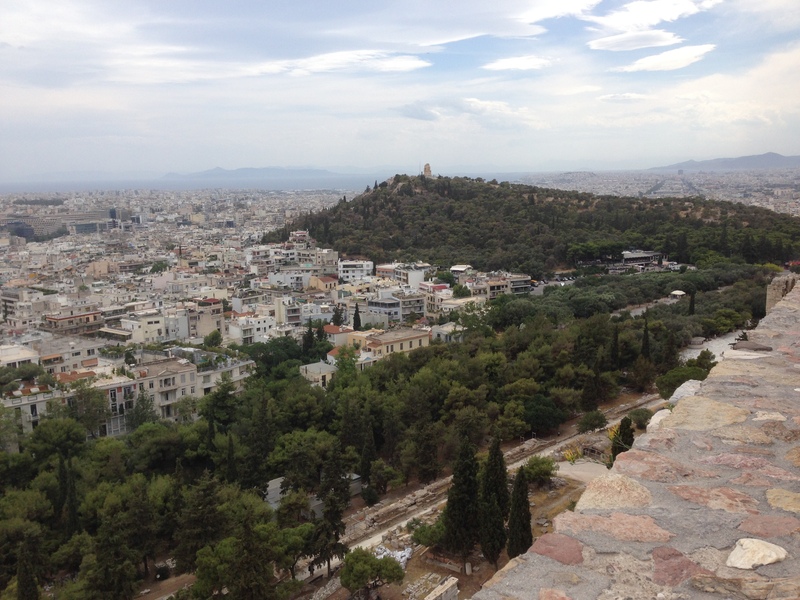 Why not climb up the hill and see the Parthenon again? 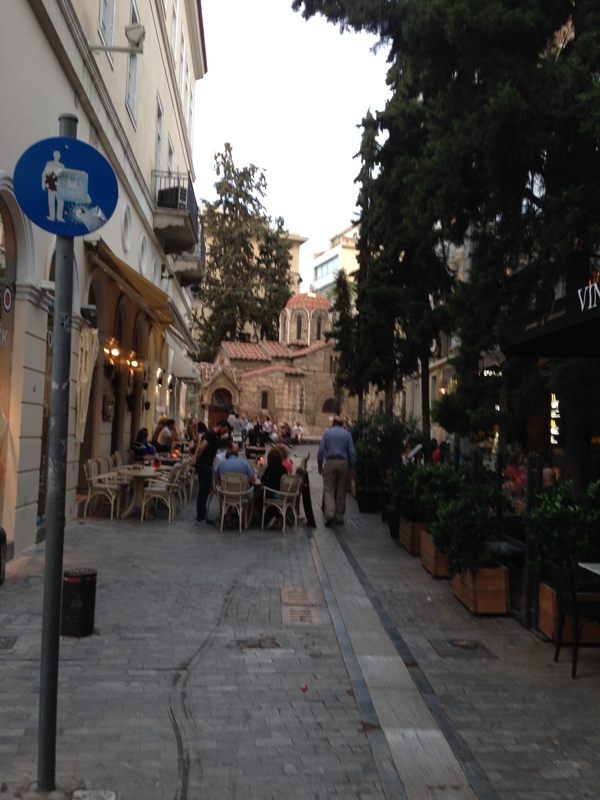 Incidentally, that large black modern building behind the theater is the Acropolis Museum we visited yesterday. So we climbed. What a beautiful tree. 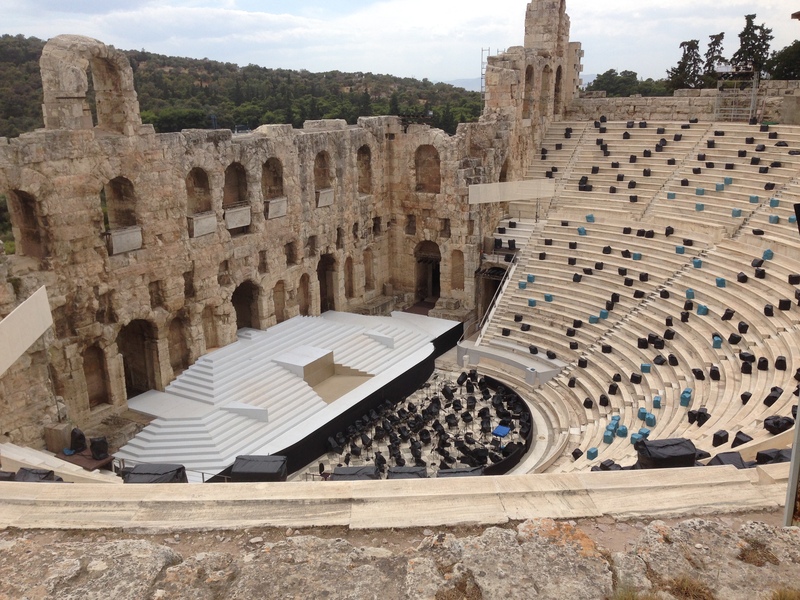 This is the Odeum of Herodotus Atticus. 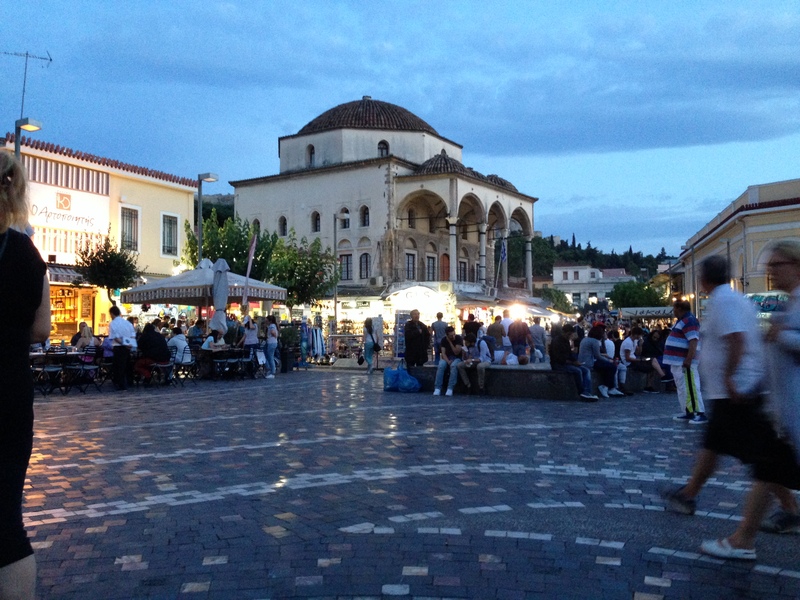 After being partially restored by the government in the 1950s, the theater is used today for concerts and events as part of the annual “Athens Festival”. The black and blue bags on the steps contain seat cushions, protected from the weather. 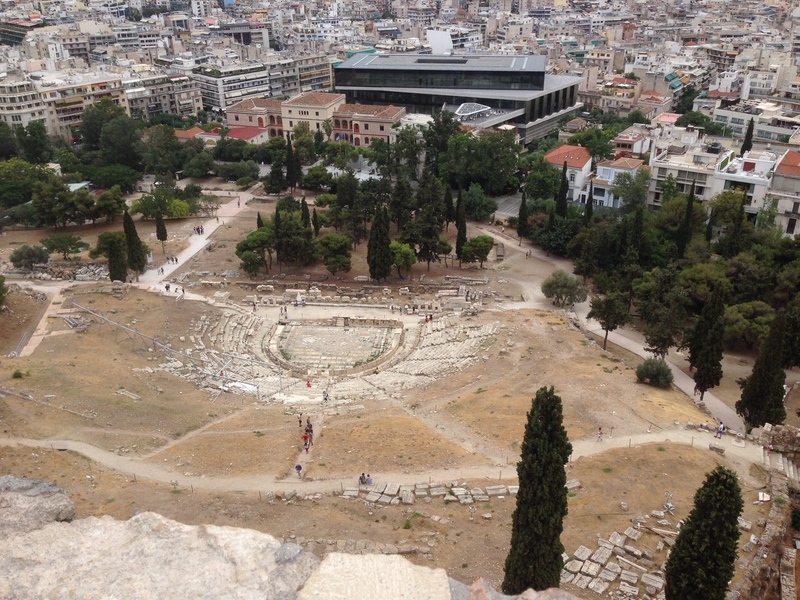 The Theater of Dionysus as seen from the top of the Acropolis wall. Monday crowds are much smaller. I believe all the cruise ships sailed on Sunday. We took our time re-seeing all the things we had to look over people’s heads at yesterday. Filopappou Hill in the distance, with a monument. 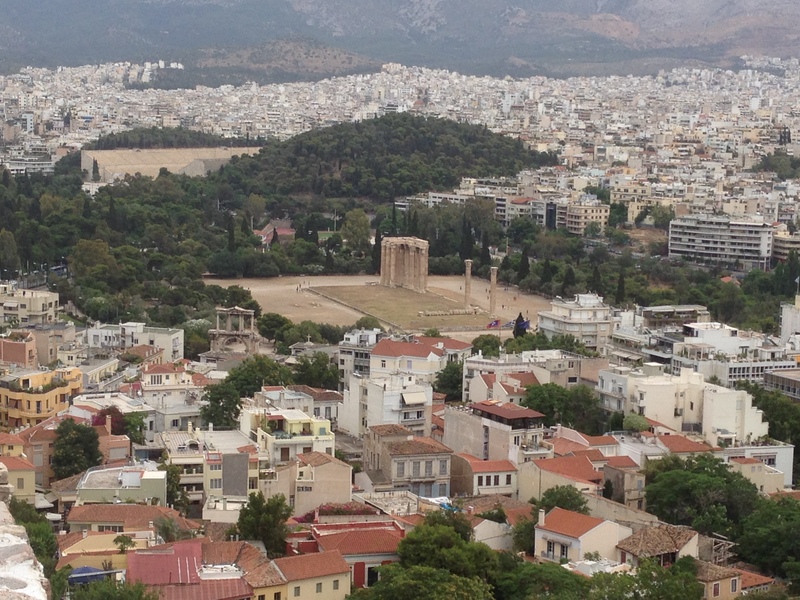 That’s the remains of the Temple of Olympian Zeus in the center and the Arch of Hadrian can be seen slightly to the left. 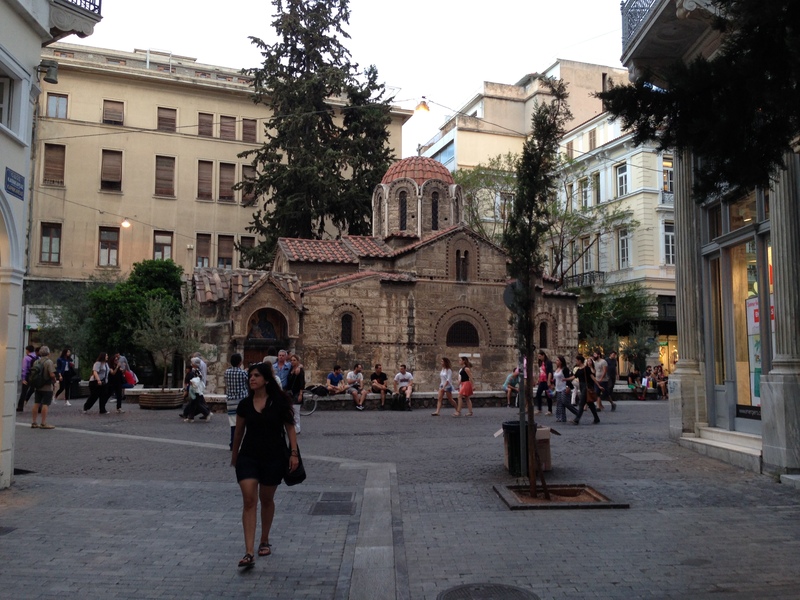 After our personal Acropolis tour, Betty wanted to visit the Monastiraki Square neighborhood, so we jumped on the subway and arrived around dusk. How will we ever be able to find a spot for dinner? Note the parking. 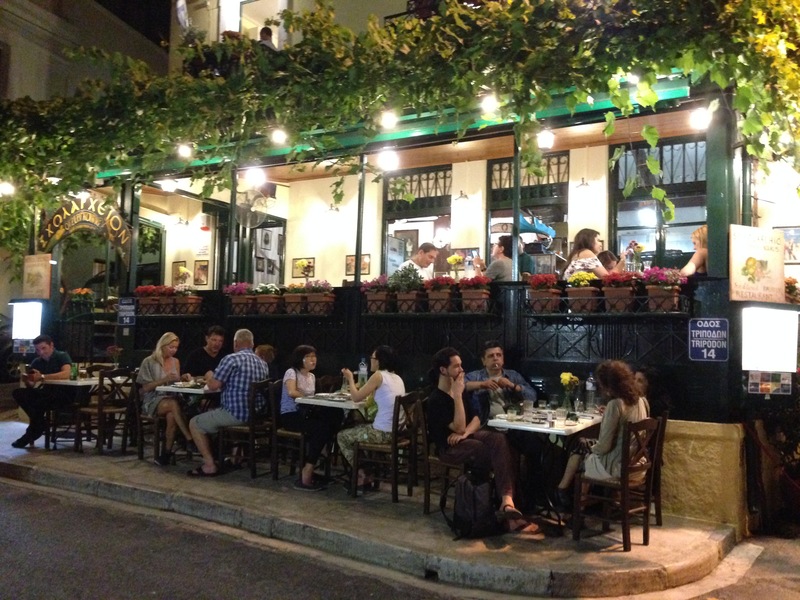 After 30 years with a garage, I could never parallel park here in Athens. 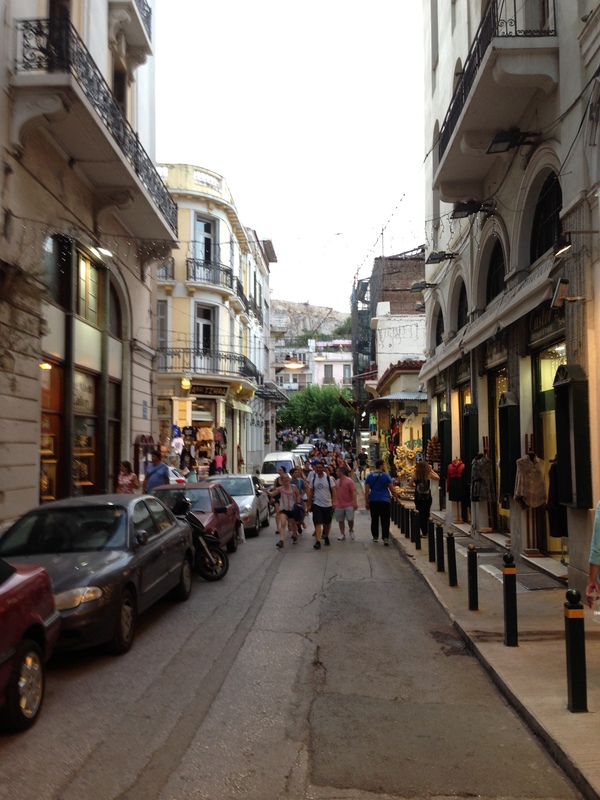 The yellow building is the Monastiraki subway station. Success! 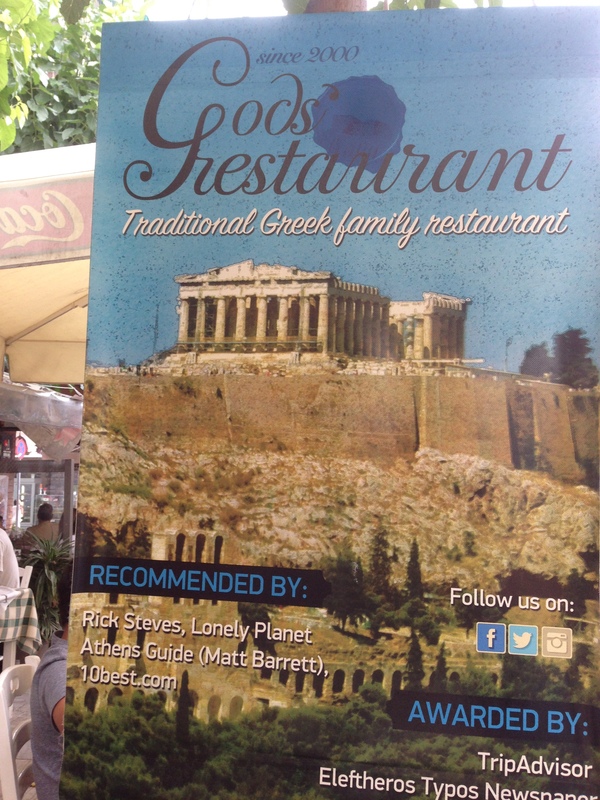 We found a cheerful restaurant willing to take us in. 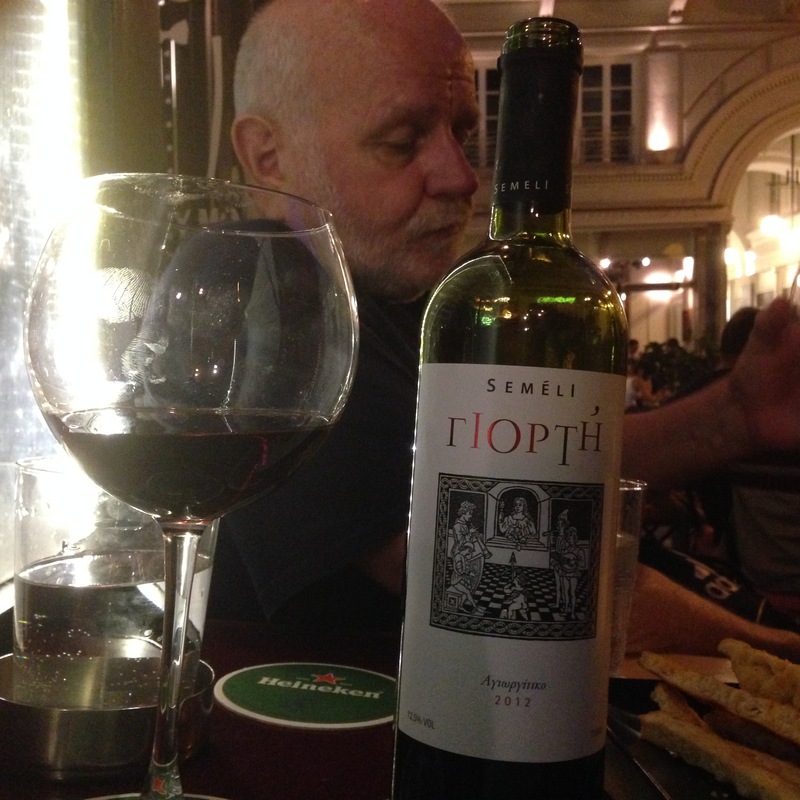 A bottle of local wine to celebrate a terrific vacation. 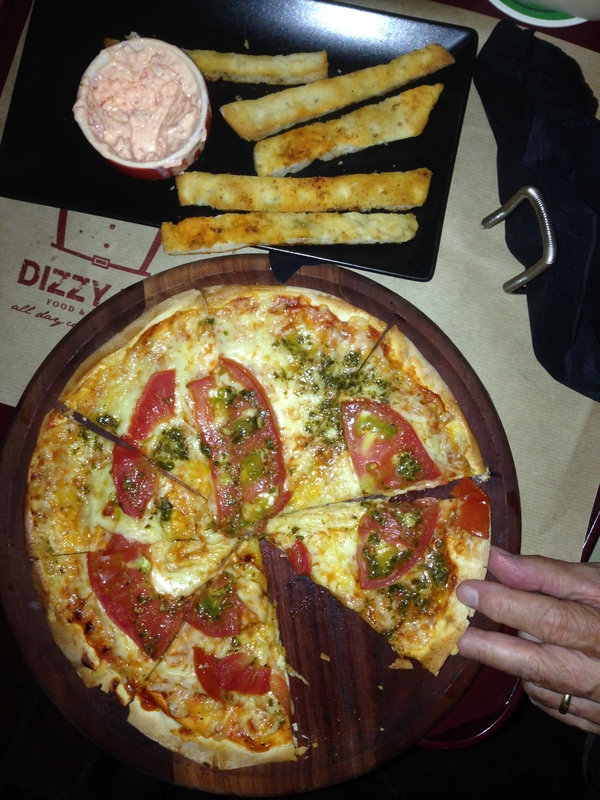 Some really great thin crust pizza. It was beyond delicious. We picked out a perfect people watching spot. The people who are being watched. We picked up around 11PM, and trudged back to the hotel to pack and get ready for our 8:45AM trip to the airport tomorrow. 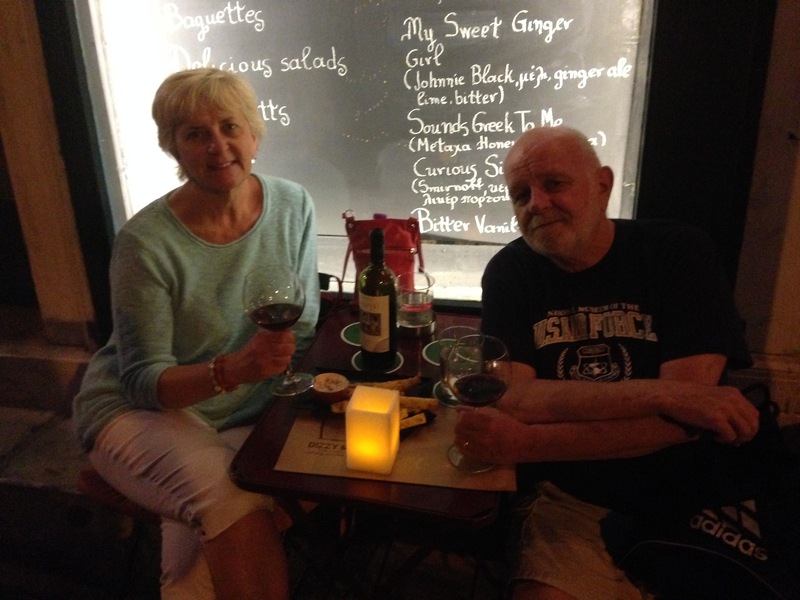 What a wonderful ten days, happily spent traveling to exotic places with my favorite companion. Several bucket list items have now been checked off, but we have plenty left. Anyway, this is how we spent our summer vacation. Thanks for dropping by. 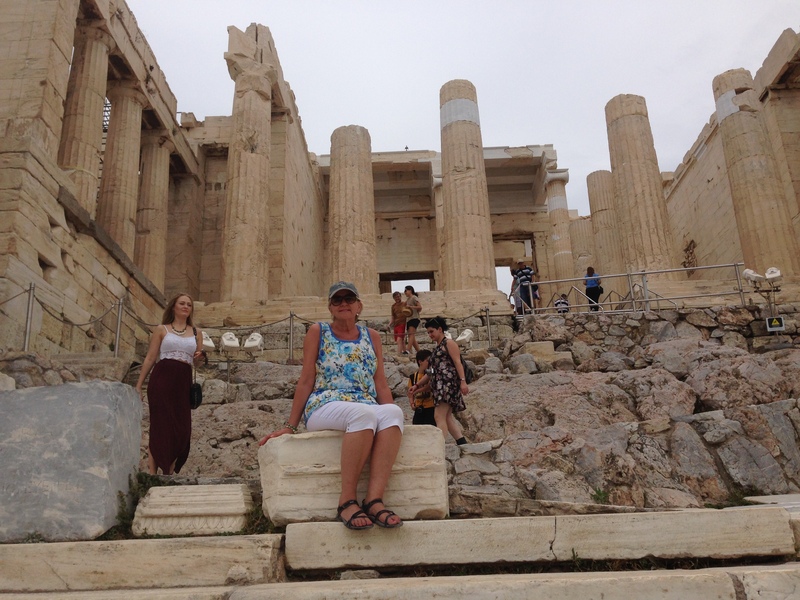 This entry was posted in History, Travel and tagged Acropolis, Aegean, Athens, Cruise, Greece, Parthenon, Royal Princess, travel. Bookmark the permalink. Loved reading all your reports plus the great photos! !